He's captain of the castle guard. SH Figuarts brings you figures from Kingdom Hearts, the smash-hit game series that has sold more than 20 million copies worldwide! 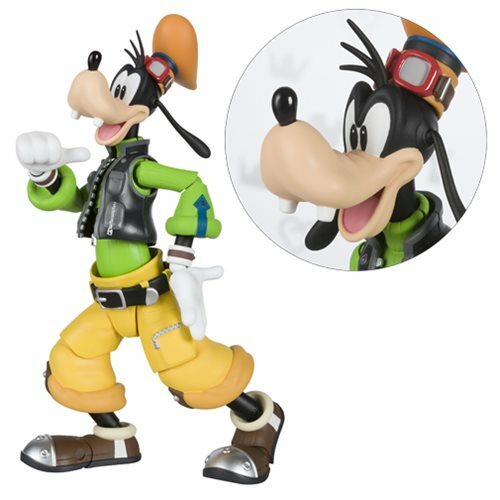 The Kingdom Hearts II Goofy SH Figuarts Action Figure features Goofy as shown in Kingdom Hearts II. Designed for fun, this action figure takes all sorts of poses! The figure includes 3x optional facial expressions, so you can re-create all sorts of scenes! Also includes 1x pair of optional hands, an optional head, and a stand. Measures about 5 9/10-inches tall. Ages 14 and up. Made in China.